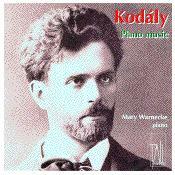 This CD contains almost all the music for piano written by Hungarian composer Zoltan Kodály. Wisps of folk melodies and doleful eastern European harmonies colour these works, which is still languishing outside the concert halls. The only work you'll probably know is the 'Dances of Marosszek', a lively tempestuous piece more well-known in the orchestral version. The CD contains impressive music making from veteran Adelaide pianist Mary Warnecke. Anyone interested in exploring unjustly under-cartographed piano repertory will treasure this release. For years Mary Warnecke has been Australia’s most tenacious champion of Koday’s piano music. As any avid Adelaidian recital attendee will attest, her perennially ambitious programs often showcase the composer, and scarcely any of her students fail to colour an honours recital with at least one of his miniatures. This release amply demonstrates how richly rewardiug to play Kodály can be, provided the performer is in command of a sympathetic instrument and the right interpretative tools. Producer/engineer Belinda Webster shines an affectionate and revealing light on Newcastle’s mighty new Stuart and Sons piano. a powerhouse instrument much in media limelight of late. Warnecke fashions its ringing treble, pellucid bass and enduring reverberation into an ideal canvas on which to explore this composers’ very singular colouristic palette. Many of the multitudinous arrows in Warnecke’s interpretative quiver are shot to great effect, Throughout the Debussy Méditation, there shimmers an unfailing legato which bevels the Magyar angles of the Kodály lyric. Try the ‘Epitaphe’ from the weighty Seven Piano Pieces for ideal, utterly unbarbaric drama, or the Marosszek Dances (welcome here in its original version) for some pacey yet paced, rhapsodic gypsy fervour. Warnecke is unafraid or the space between Kodály’s molten overtone saturated octaves, and, admirably. cajoles rather than coerces rhythmic tension from his strident ostinati. This is a stride forward in the advocacy of this seminal composer. With Warnecke in the stable, Tall Poppies should feel confident in embarking upon a major Kodály survey. Mary Warnecke’s flrst disc for the Tall Poppies label was a recital of works by Schuhert , Chopin and Liszt, and it contained some marvellously refreshing, dogma-free heart-on-sleeve playing of rather familiar works. For her second recording, Warnecke concentrates on a single composer and repertoire that will be unfamiliar to many listeners. This CD has surely been an education for me, and let me begin by adding Kodály’s name to the above role of honour bearing the names of those composers who were affected by the music of Debussy. The debt is clear in the Méditation sur un motif de Claude Debussy, in which Kodály bases his music in the motto theme from theme Debussy’s early string quartet, but in the collection of pieces that constitutes his Opus 11, Kodaly is even more obviously Debussian in his use of harmony, gesture and colour. Warnecke plays all this music with real understanding – one imagines many of the pieces have been in her repertoire for years – and she is greatly assisted by the Stuart & Sons piano at the Newcastle Conservatorium: the instrument enables Warnecke to produce phenomenally smooth legatos and pianissimos that glow with colour, yet it yields to no other piano I’ve heard in its capacity for grand, burnished fortissimos. The recording is particularly lifelike.